Michael: How do you think Marvel editorial goes about creating another “Vs” mini-series? Is there a quarterly mandate they must fill? Is it a writer’s repurposed series pitch? I suppose there must be some sort of demand since they keep making them, right? In spite of that I must say I was pleasantly surprised by Black Panther vs. Deadpool 1, a book that accurately depicts the tones of these very different characters without compromising either one of them. We quickly transition to the Deadpool-of-it-all of the issue, which provides the narrative through line at work here. If you are a regular reader of Retcon Punch then you’ll know how much we enjoyed Gerry Duggan’s take on the character, giving him a little bit of heart to temper/match his wackiness. I give props to Daniel Kibblesmith, who gives Deadpool a motive that is at the same time selfless and entirely his fault. Deadpool may at times be a death-worshipping maniac, but he’s also pretty lazy. He’d rather take the easy route and get the vibranium he needs to save the “friendly neighborhood mailman Willie Lumpkin” than be bound by cliche narrative restraints. 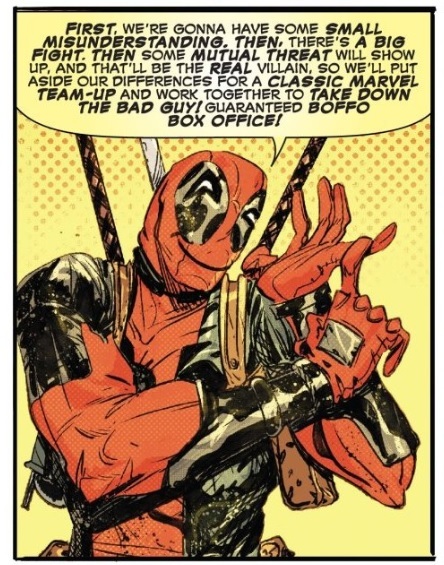 While Deadpool is a character with mass appeal, the ability to make him work within a story is no small feat — he has to be just the right amount of funny and insufferable, otherwise he runs the risk of becoming Jar Jar Binks, essentially. Kibblesmith actually makes Deadpool pretty funny — 5 points for the teleporter pouch reference. First off, he is (unsurprisingly) using a cartoon catchphrase from Darkwing Duck, maybe because of the Disney/Marvel connection? More to the point though, López Ortiz puts some cartoon physics into action as the wrecking ball is moving so fast that its shape distorts into an oval. 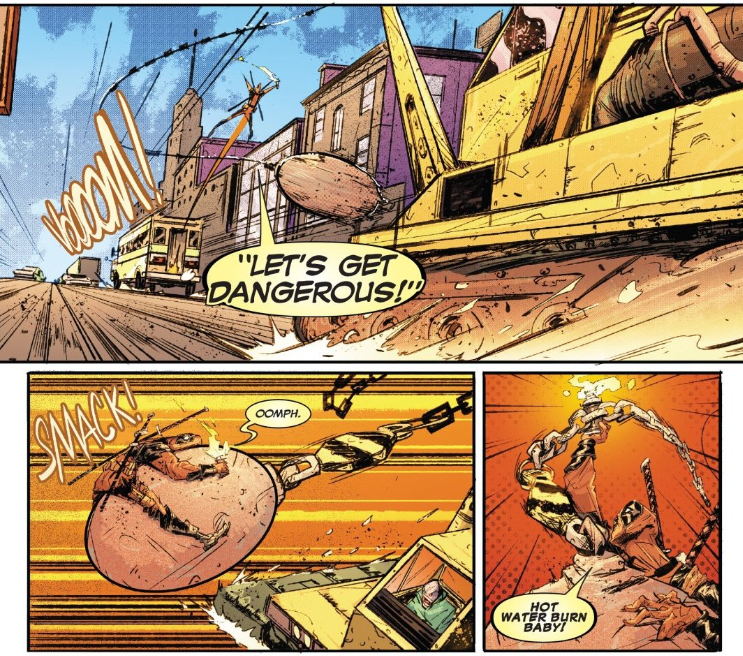 Deadpool’s body is similarly compacted a bit as he is SMACKed and hurled at high speeds by The Wrecker. And like a cartoon/comedy, the goofiness of the screwball character is offset by a straight man — in this case Black Panther. T’Challa is by no means a boring stiff however. Kibblesmith uses the regal nature of the king and the advanced technology of Wakanda to make T’Challa an intelligent foil who has no time for Wade Wilson’s buffoonery. In fact, he uses that big brain of his to teach Wade a thing or two about himself. Excuse me, did a book called Black Panther vs. Deadpool just rewrite the book on Deadpool? I love this idea, and whether or not it actually sticks, it’s enough to piss Wade off enough to fulfill the promise of this book’s premise. After all, wouldn’t you be a little mad if someone claimed to have shaken your whole reality upside down? Drew! Hakuna Matata my friend! Did you enjoy this book as much as I did? I know I spent a lot of time on Deadpool, but did this depiction nail your platonic ideal of Wade Wilson? Do you think that T’Challa is being obstinate just because the story calls for it? Or is his “not one inch” philosophy justified? Drew: T’Challa taking a hard line stance definitely fits my conception of the character. Kibblesmith finds a way to make that “not one inch” philosophy literal, but keeping vibranium out of the hands of murderous madmen is definitely part of my platonic ideal of the character. Indeed, that Black Panther is so unyielding in this regard makes him a brilliant counterpoint to Deadpool. Or is it that it makes Deadpool a brilliant counterpoint to him? Any reasonable character would reject the absurd non-logic of “Let’s you and him fight,” perhaps instead choosing to appeal to T’Challa’s selflessness to explain how he could help save an innocent man’s life. But Deadpool has never been a reasonable character, so he leans into that trope (after hanging a big old lampshade on it), rather than working to avoid it even though he sees it clearly. 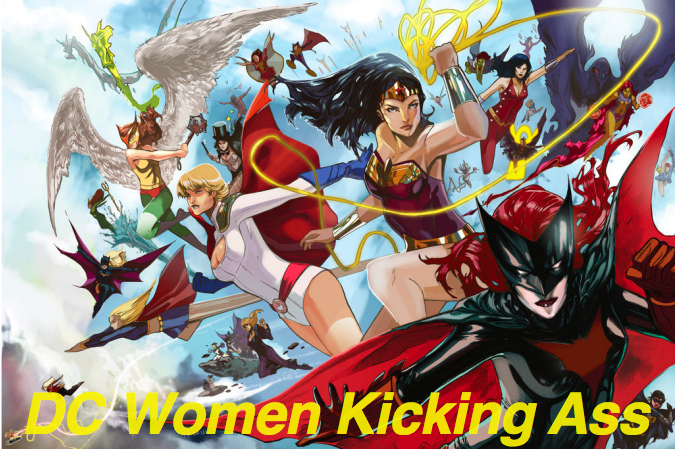 And honestly, it’s that little twist on the formula that makes this issue work for me. Rather than wondering why these two can’t just use their words to work things out, I recognize that Wade is pushing T’Challa’s buttons on purpose, fulfilling the very formula he laid out in that panel Michael posted. He even calls out the beats as they’re happening! Again, where a sane character would avoid escalating the situation, Wade relishes it. He’s in a “vs.” issue, so he might as well enjoy it, right? And for me, that’s why the art style is such a brilliant match. Michael’s right to point out the cartoonish nature of López Ortiz’s sense of exaggeration, but I’d argue that that’s also why the T’Challa scenes work so well, too. T’Challa feels particularly regal and serious, not because López Ortiz is grounding those scenes and designs in reality, but because he’s exaggerating different elements (the regal, serious ones). T’Challa is statuesque with a furrowed brow, sure, but he’s far more statuesque with a far more furrowed brow than anyone ever truly is. López Ortiz is heightening those characteristics so they read clearly even when his figures are small in the frame. But it’s the ways López Ortiz maintains those characteristics throughout the issue that really catch my eye. Just look at the way López Ortiz uses their posture to capture the spirit of these characters. Deadpool is slumped and slouchy, with his shoulders rolled forward in a closed, defeated stance. Black Panther is the polar opposite, with a straight back and his shoulders pulled back, projecting his confidence out into the world. That’s a dichotomy that’s easier to maintain when these characters are just talking, but I’m fascinated at the way López Ortiz carries it through the action scenes, as well. This is a great testament to the power of cartooning in comics — their acting is that much clearer because of the exaggerated, impossible nature of their gestures and anatomy. Between the art and the writing, we’re getting some very strong, very clear characterizations for these characters because (not in spite) of the silliness.